Add an extra spice and taste to meals with our Indian Red Chili Paste. 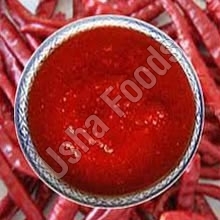 We are credited as a dominant Red Chili Paste Manufacturer, Exporter and Supplier from Mumbai, Maharashtra. Our Indian Chilli Paste is spicy, hot and very tempting. This Lal Mirch Powder is ideal for preparing many cuisines like North Indian, South Indian and Chinese. We provide our variety of Chili Paste in customized packaging.